Ruscombe Green: Where are Stroud's drinking fountains? 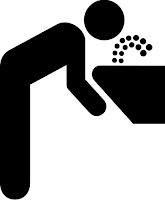 Where are Stroud's drinking fountains? Last year I blogged about drinking water fountains in our parks - see here - well while I was away earlier this month a new campaign was launched to improve the public’s access to free drinking water. The ‘Find-a- Fountain’ project has been developed by Guy Jeremiah and is now part of the 1859 Drinking Fountain Association. It aims to record all publicly accessible drinking water fountains across the UK via a specially designed interactive website - starting a renaissance in the use of drinking fountains in order to reduce the UK’s reliance on inefficiently produced bottled water, and lessen its negative impact on the environment. This blog has covered lots on the horrors of bottled water....the average person in the UK buys 85 bottles of water a year and a typical local authority in the UK has to dispose of up to 10 million bottles a year, at a significant cost to tax payers. An excellent initiative, Philip. I was just reflecting earlier this week how civilised it is in Turkey to have so many drinking fountains. Alas, I fear that many people in the UK might not treat such places with due respect as they go out on their binge drinking sessions.